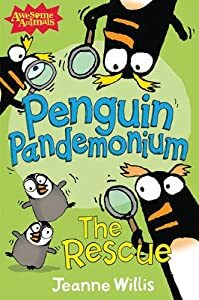 In Penguin Pandemonium: The Rescue , two baby penguins are missing and the rest of the City Zoo penguins set out across the zoo on a daring rescue mission. They hang with the monkeys, fish for clues in the aquarium, and try not to get spotted by the leopard in a fast-paced adventure full of fun. I loved the first book from this series that I read and this is just as good. I was really impressed with how well this book grabbed my attention and my daughter and I were captivated from the beginning to the end. The story was funny, and a provided some great laughs. I was continually wondering what would happen next and what other troubles the Penguins could get into. This was a great story and whether you read the first on this series or not, you will love this just the same.